Question: Bill, I have completely gutted and remodeled one of my bathrooms. The bathroom is now on a separate load center (sub panel)fed from the house main breaker panel. All of my electrical wiring is in PVC conduit. All boxes are metal and with ground attached to each box. I checked the light circuit and the receptacle circuit with a drop cord from another house circuit prior to installing any drywall. All lights and receptacles worked fine. The drywall is complete and painted. I installed 15A GFCI breakers for my receptacles and my light circuits. There are five receptacles on the circuit and five lights on the lighting circuit. The LED checker indicates proper polarity on the receptacles. However, when anything is plugged in to any receptacle, as soon as it is switched on, the GFCI breaker trips. Same thing with the lighting circuits. I took out the GFCI and temporarily replaced them with a regular 15A breaker. Lights and receptacles work fine. I reinstalled GFCIs and began trouble shooting; I found nothing. Next, I disconnected all of my wires from the neutral bar and disconnected all hot wires from the breakers, except the neutral on one of the GFCIs. To this breaker I ran a temporary hot wire (black)to the GFCI breaker and a neutral (white) to the neutral bar and attached a porcelain socket (with pull switch) and bulb. As soon as I pulled the switch the breaker tripped. I have continuity between earth ground and neutral in my load center. I also, have continuity between ground and neutral in my main breaker panel. I should have continuity between these two? What am I doing wrong? Sorry if this is a little wordy; I just wanted to be concise. Thanks for any advice. It sounds like you have the line/load of the neutral path messed up. Your breaker should have a white pig tail going to your neutral bus bar. 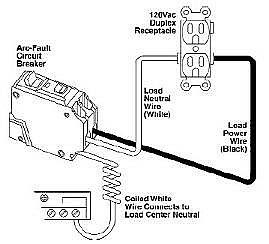 (line) Then there should be a spot on the breaker where you install your circuit's neutral under a set screw. (load) If your neutral from the bathroom goes strait to the bus bar you will have a problem just like you described.